About Khaled Talib: Khaled Talib is a former journalist turned PR pro, and the author of the upcoming thriller novel, Smokescreen. He lives in Singapore. The Book: Are you romantically in love with words, a writer or an aspiring author seeking inspiration? 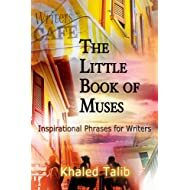 The Little Book of Muses is a collection of more than 160 personal phrases by author Khaled Talib. The Little Book of Muses is a quirky, clever and inspiring read to influence musings, daily writings and enriching one’s work. A good-feel guide to enhance one's savoir faire, and make a writer passionate and motivated about their craft. Some of the phrases will tickle your funny bone while others offer nuggets of wisdom condensed into a few lines. This delightful book is a collection of the authors muses written for writers and aspiring authors. Within its pages, there are phrases, which will appeal to everyone, some witty, some inspirational and others thought provoking. As I wandered through I discovered that some immediately installed themselves in my memory for the future, whilst others, I know are lying in wait for my next visit when my mind is in a different mood. I thoroughly enjoyed reading this lovely book, from the entertaining science fiction based Foreword, to the end, and know I will enjoy dipping into it for many years to come.